Sometimes you hit upon a food and beer pairing that just blows you away. Something so harmonious that you just can't put into words how great the flavours are. With that in mind, I won't really attempt it. Instead, I'll just blog the pairing and some minimal thoughts. Sam Smiths Raspberry Fruit Beer. Chocolate Torte from Patisserie Lila at Borough Market. Job Done. The sweetness meets the sweetness. The fruitiness meets the fruitiness. The carbonation in the beer picks everything up and dances it off your palate, leaving you ready for more. If you get the chance to try it, go for it. Fantastic, say no more. “Patisserie Lila” place is a good example for how a seriously bad place can still make good business: Because the “Patisserie Lila” is conveniently located near the bustling, fashionable Borough Market, passer-bys will always be lured in – just like it happened to us. Once inside, however, we experienced a service that could hardly have been worse: As we were “only two people”, the sour-faced waitress asked us to join people at another table – which surprised us but it did not put us off. When we had a look at the menu, we were a bit shocked by the rather unreasonably high prices – but we ordered a coffee and chocolate cookies anyway; only to be told by a truly pissed-off waitress that we had to order more to stay which we found very odd indeed. When we pointed out that we were not too hungry really, we were told to leave. Quite an experience! Don’t go – this place is the worst rip-off I have experienced since I came to London in 2004. You're dead right about location. The majority of people that enter the market will do so via Patisserie Lila. Location, location, location! Sorry to hear about the service you had. The cake I mentioned in the blog was actually from the market stall, not the cafe. I've been to the cafe a few times though and I have to say I've always had good service. Perhaps I've been lucky? It isn't a cheap place to stop and eat, but nowhere in Borough market is. It can be very over priced at times, but to be fair that's true of the market as a whole - not just Patisserie Lila. Back on the subject of the food pairing. 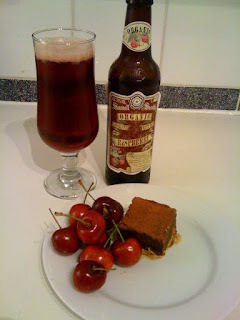 Any very chocolatey cake will work just as well with the beer. Maybe you could try it with one of your favourites from a different place?